Here’s a way to deplete your stash using up fabrics that have been sitting around for a while. This is my almost completed rag-rug made from 2” strips of batik fabrics. I use Aunt Philly’s toothbrush needle which is more ergonomically friendly on the wrists than trying to make a fabric rug with a large crotchet hook. You can see the blue plastic needle in the picture. These were originally made from toothbrushes in the days when toothbrushes had holes in the handles. The head of the toothbrush was removed and filed into a point. About 20 years ago, toothbrush manufacturers started making fancy handles and dispensed with the hole, so Aunt Philly now makes these needles. Check out her website for more information. This is a fun fireside project that doesn’t require much effort and can be done in low lighting while watching TV. I made one last year and gave it to a friend as a gift. It turned out that her dog absolutely loves it and it became the hanging out and sleeping place of choice! 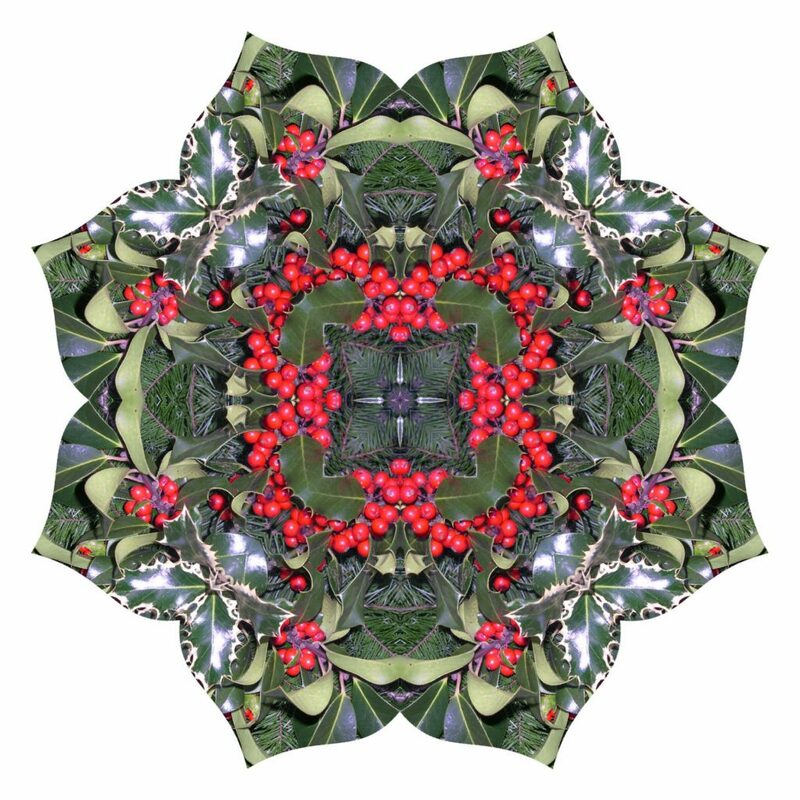 Image made from a photograph of Christmas greens using Kaleidoscope Kreator computer software. (Fun and rather addictive!). 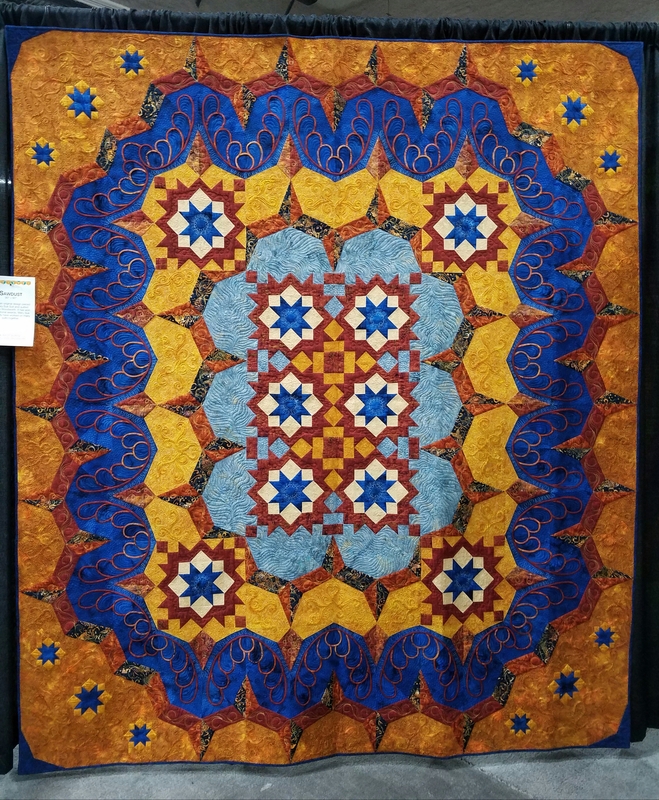 I’m still savoring the many beautiful quilts that I saw at the AQS Show in Des Moines in October. 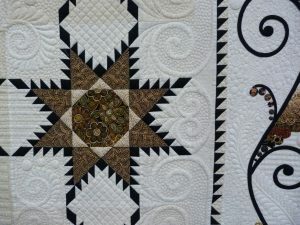 With Christmas rapidly approaching, this seems an appropriate time to share a couple of gorgeous star quilts that were exhibited. The first was in a special exhibit, The Art of Quilting, Quilts by Judy Woodworth. 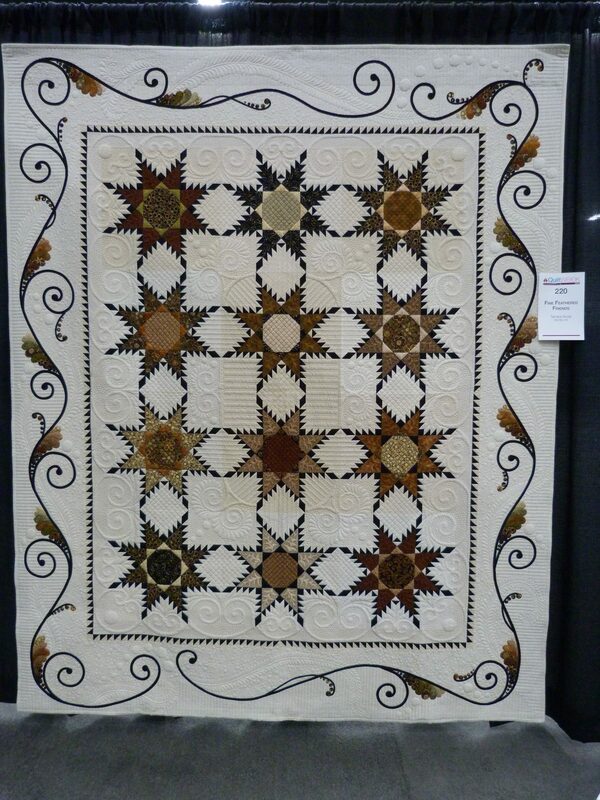 Sawdust, 90″ x 90″, is an original design pieced by Mary Sue Suit and quilted by Judy Woodworth. This award winning quilt is one of several on which Mary Sue and Judy have collaborated. I love the rich colors especially the royal blue which majestically frames the stars in the center. 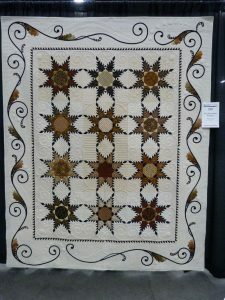 The second is Feathered Star quilt which was in the judged show. 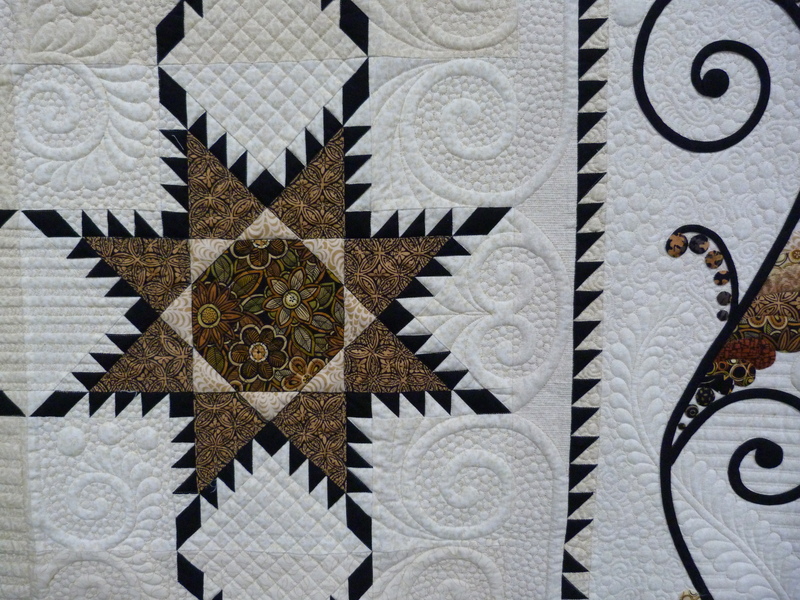 I have a soft spot for these especially when they are well executed with exquisite quilting like this one. Fine Feathered Friends, 71″ x 87″, was made by Tamara Gross of Wichita, KS and long-arm quilted by Jan Hutchison. I like the way different background fabrics were used for the stars, adding interest to the quilt. There’s an attractive variety of browns used too and it all looks very crisp and clean. The intricate machine quilting patterns tremendously enhance this beautifully pieced and appliqued quilt. The first weekend in December is a busy one on Bainbridge Island, WA. Both Christmas in the Country and the Studio Tour offer several locations where artisans display and sell their work. 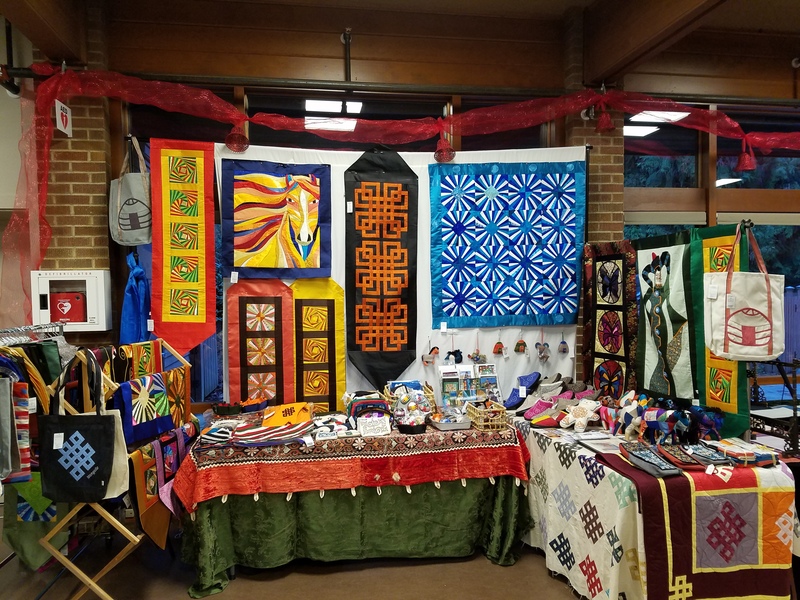 Four years ago, St. Barnabas Church, (our USA non-profit host for the Mongolian Quilting Center), became a Christmas in the Country venue, and we have had a booth at this event ever since, selling Mongolian products. This is a great opportunity to raise money, and since St. Barnabas donates the book keeping, 100% of the funds go to the Mongolian Quilting Center. Here is our booth. The Mongolian women are excellent seamstresses and the silk patchwork products that they make are stunning. Selenge Tserendash is able to get silk scraps from a clothing manufacturer in Ulaanbaatar, and the women use these to make beautiful Twisted Log Cabin and Fan blocks which are then assembled into larger pieces for table runners and wall hangings. They also use them for small coin purses and cosmetic bags as well as patchwork horses. Cashmere scraps are available too, and these are used for patchwork goats and camels. Some of the women make felted slippers and these are always popular. The event ran for three days and we were delighted to raise $3,103 which will go towards operating and maintenance costs at the Mongolian Quilting Center, including wages for women doing piece work who would otherwise be unemployed. If you are interested in purchasing any products, please contact me via the contact page on my website.